Personalized Horizontal Hanging Slate Address Sign - - 19"W x 12"H. Made in USA. This custom-made slate sign features a design in the center with one line of personalized text at the top of the sign and one line at the bottom. Two styles: One-sided sign or two-sided sign. Note: same personalization and design appear on both sides of a two-sided sign. Each line of personalization holds fifteen (15) characters (using both upper and lower case letters as shown). Note: character count includes spaces and punctuation. Designed to hang from a larger bracket with holes 14" apart (your own or the optional Stone Mill wrought iron bracket shown in top link in Related Products). Color combinations: black with gold text and white frosted design or green with white text and black design, black with white text and white design. Exceptions: The mountains and shamrock designs are individual, in that the shamrocks are painted green (on the failte sign) and the mountains white with green trees below (on the mountains sign). Nine design choices: cats, dogs, horses, mountains, adirondack chairs, deer, trees, leaves, pineapple, and the Irish word "failte." Made to order. Delivery time: please allow 3 to 5 weeks for delivery. Hang on a post close to the road for excellent roadside visibility . . . especially good on rural roads, for businesses, and farms. NOTE ON SLATE: Slate is a natural product of the earth with features and color variations inherent in the rock. These variations enhance the natural beauty and unique character of our slate signs. 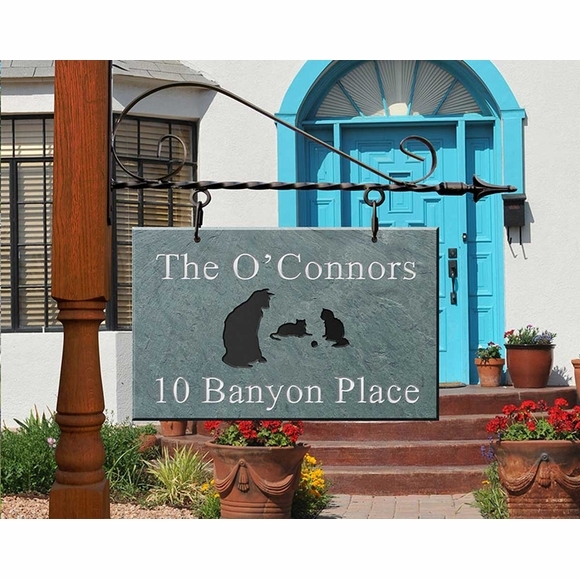 Our hanging slate address signs come in a other sizes and design styles (see Related Products).